The SMS trashion team has spent over a year planning what is set to be a highlight of the 2019 STEM Leadership Conference—talented students showcasing their artistic prowess through a runway fashion show featuring designs made from upcycled materials. The student-led charitable event aims to raise awareness about the importance of sustainable fashion, kicking off the conference theme, Sustaining Our Future, with a bang. Trashion (a portmanteau of “trash” and “fashion”) is a term used to describe fashion made from thrown-out, found, and repurposed elements. It puts a name to a philosophy and an ethic encompassing environmentalism and innovation that is realized by using recycled materials and upcycling trash to generate items with renewed value. 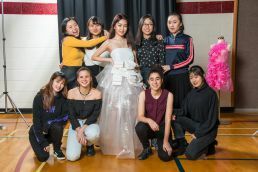 The team is led by Grade 12 student Corey Sham, who was inspired by the concept after participating in a trashion show at her former school in Hong Kong. With the focus of the STEM Leadership Conference being environmental sustainability, a trashion event was a perfect fit. “The goal is, as a team, to make a positive impact on the community. It’s a charitable event with proceeds from admission donations going toward the WE Organization to help support programs that create a sustainable impact,” said Corey. “A personal goal of mine is to provide a platform for students to have the freedom to express their ideas in a unique and challenging way, and to ensure that everyone is happy with the work they are doing,” she said. During the design process, the trashion team encouraged designers to focus on body positivity and creating fashion and designs for people of all different shapes and sizes. The event isn’t stirring up interest just within the walls of SMS. The Bay Centre in downtown Victoria was so intrigued by the initiative that they offered to showcase the designs for a week prior to the event as a promotion. The student-designs will be on display at the Bay Centre from April 15-19, 2019. The team has also been working closely with the SMS Outreach Club who is coordinating the fundraising portion of the event. Entry to the event, which kicks off at 6:30 p.m. on April 25, 2019, will be open to all STEM Leadership Conference attendees as well as the public, with admission by donation. We encourage the entire SMS community to come out, support a great cause, and check out some amazing and creative fashion.